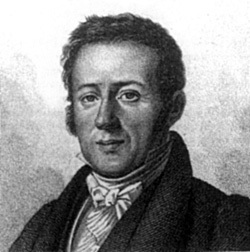 René Primevère Lesson was born 1794 in Rochefort. He entered the naval medical school in Rochefort when he was sixteen and participated in several expeditions. He served in the French Navy during the Napoleon area. He boarded the expedition directed by Duperrey on La Coquille (1822-1825) as a doctor and collected a various of specimens in Chile, Peru and the Falklands. When he returned to Paris, he prepared for seven years the official account of the expedition. Beside several publications, he also produced monographs on hummingbirds and birds of the paradise. He died in 1849. Lithography of an animal. Hummingbird. Printed in Paris by Arthus Bertrand in 1829. René Primevère Lesson: Oiseau-Mouche à Couronne Violette.